With more than 175 years of experience, Weishardt is among the very first pioneers in the gelatine industry. Today, this family owned company is among the world top producers and your supplier for high quality pig and fish skin gelatine, fish collagen peptides and texturizing systems. Weishardt is a global producer with its headquarters in South of France. Weishardt, thanks to sales subsidiaries and 4 production plants located in Europe and north America, exports its large products range worldwide. For optimal efficiency , Weishardt takes the committement to work closely with you, as a reliable partner to fulfil your most challenging requirements. Weishardt’s processes and products are certified according to high level food safety standards. Weishardt’s R&D teams are constantly focusing on technology, innovating products and processes, and health and beauty concepts. Involved in the protection of environment and well-being of its employees, Weishardt is constantly working on its active sustainability program and has already implemented a CSR management system. 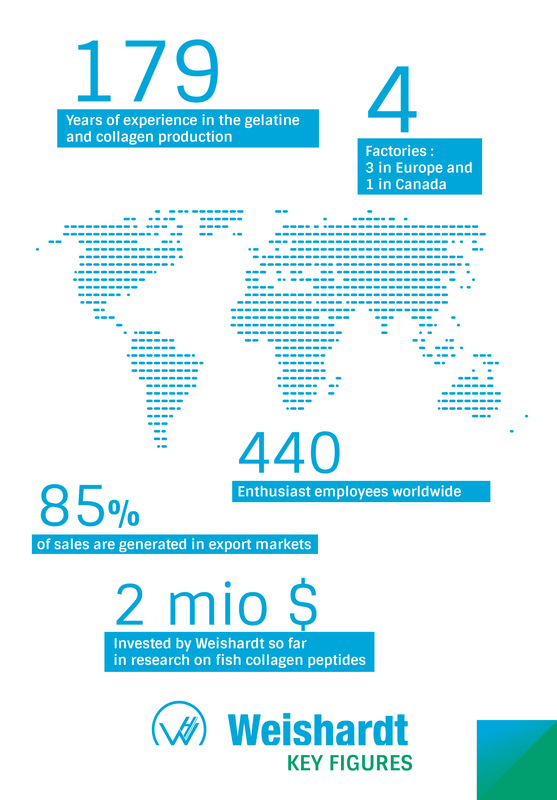 Weishardt developed a full range of specific fish collagen peptides, registered under the trademark Naticol®, mainly used in functional food, supplements, nutraceuticals and cosmetofoods. The benefits of Naticol are demonstrated in the results of our most recent clinical studies. Weishardt : The right choice to bring value to your innovation.